Google may be the first company to come up with the concept of Smart Eyeglass. They had actually developed one and introduced in the market. The Google Glass Explorer Edition Kit was priced nearly $1500 but now Google just stopped the Explorer program. The next tech giant to come out with such a technology was Microsoft. Microsoft’s HoloLens which will provide a mesmerizing experience to the users. They are trying to link the system with Windows 10 OS and planning to release the gadget by the end of this year. 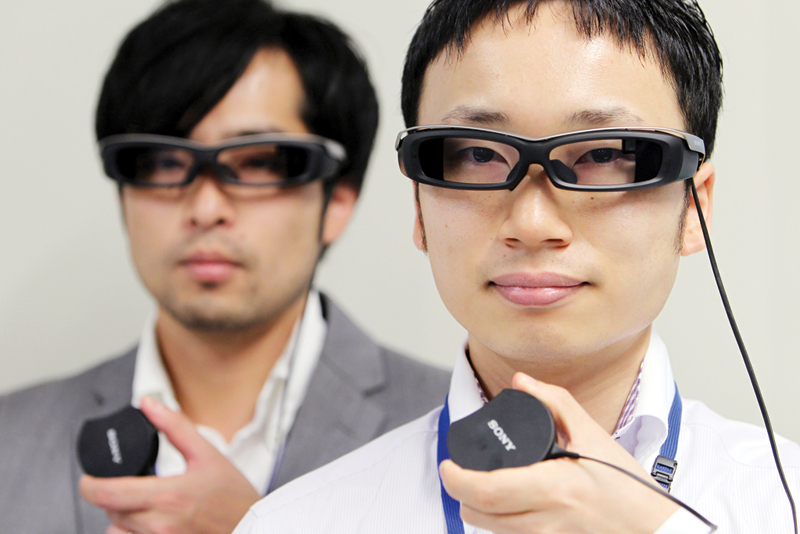 In the meantime Sony has come out with its own version of Smart Eyeglass. The company reveals it to be the developer edition and named the model as Smart Eyeglass Developer Edition SED – 1. They are set to sale in 10 countries including United Kingdom, America, Japan and certain other European countries. The new gadget may costs around $840 or 670 euros or 100,000 yen according to the place of its sale. For the time being Developer Edition is set out for sale. It means that the model is not aimed at ordinary gadget users. The edition is mainly targeted on those tech coders who can develop certain applications to improve the functions of Glass. Sony really wanted to use these applications, suggestions and feedback to develop a better gadget. When Sony finishes modifications, the final device would be entirely different from the released one in design, performance and pricing. Present design of the glass is like that, it has a pair of glasses along with thick frames. Here the lenses provide the display of data and acts just like a screen of a computer. With 85% transparency, lens allows the users to see the other side. But the same lens allows the users to see images, message texts and other things on the glass. The hardware of the new Glass includes a camera of 3 MP along with CMOS image sensors. It also has other features like accelerometer, electronic compass, brightness sensor and gyroscope. The most important advantage of Sony Glass is that it can be paired with the Android smartphone of yours. This can be done with the help of Bluetooth or WiFi. Another important aspect of Sony Glass is that it can directly communicate with certain applications working on your smartphone. Smart Eyeglass can ultimately be used to detect the location by the help of smartphone GPS receiver. The Smart Glass kit includes a separate controller that is attached to these glasses by way of wire. The kit also includes a battery for charging the device, a speaker, touch sensor, NFC and microphone.